What can a well-travelled son of a diplomat living in New York teach us about great London Dry Gin … turns out, quite a lot! 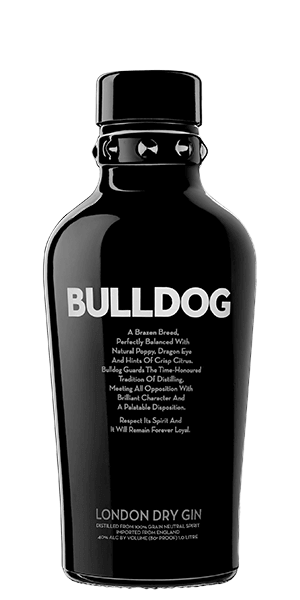 Bulldog Gin has one eponymous product … Bulldog Gin. Conceived as a business in 2006 (a Chinese year of the dog), Bulldog was officially launched in 2007 by Anshuman Vohra, who developed a passion for Gin while touring the world and sipping Gin and Tonics with his father—a professional diplomat. They focus on one thing and one thing only; making great, uniquely charactered, world-class Gin from their New York headquarters. First, “Bulldog” is genius of a name for Gin, don’t you think? The bulldog is one of those national, cultural symbols that screams “England!”. Picture an English bulldog in a red phone booth wearing a crown and drinking a Gin and Tonic and you have a quad-fecta of British iconic association that can’t be beat. They even put a little spiked collar around the neck of the bottle. Brilliant! But that is all the marketing stuff. What’s “in” the bottle is what counts right? And what’s in this beautiful black glass bottle is a truly top-shelf Gin with a fascinating character profile and superior quality. It’s 4-times distilled and features twelve—count ‘em—twelve botanicals. Yes, the juniper is there, but it takes neither a leading role nor a back seat. It is surrounded by the orris root, coriander, licorice, angelica, lavender, and lemon you might expect, but they are joined by dragon-eye from China, Turkish white poppy, lotus leaves, cassia, and almond. This is a Gin by a Gin-lover for Gin-lovers. What does Bulldog Gin taste like? The Flavor Spiral™ shows the most common flavors that you'll taste in Bulldog Gin and gives you a chance to have a taste of it before actually tasting it. Most prominent and likeable flavour is Almond. Nice mixer.